Is stress tracking the future of well-being tech? Wearable tech has come a long way from souped-up pedometers that congratulate you on reaching your 10,000 step goal each day and little else. Now wearables are well on their way to collecting more sophisticated data than we could have imagined a mere two years ago, like reading our glucose levels, keeping an eye on pollution in the air and measuring our body composition, just to name a few. One trend that’s birthed a number of innovative startups, as well as making big tech brands sit up and take notice, is using wearables to gauge our mental state, whether that’s our level of focus, whether we’re feeling stressed or even our moods. Medical professionals have long pointed to the direct correlation between the long term impact stress and anxiety has on our general health. So it’s no surprise that tech companies claiming to paint an overall picture of our health are starting to use biometric feedback to improve our emotional wellbeing and stress just as much as our physical health and fitness. As well as that, there’s a general move towards people becoming more interested in their own well-being than ever before, as well as feeling empowered to take steps to change their lifestyles and make improvements themselves - whether that’s joining a gym or trying mindfulness meditation with the help of an app. Finally, tech that allows us to find out more about what’s going on in our minds has improved. Wearables aren’t just fitted with accelerometers to count steps, but there are all kinds of sensors that can be put to good use in order to track, quantify and feedback information about our mental wellbeing - whether that’s through tracking your breath or reading EEG neurofeedback from your brain. The latest wearable from Garmin uses Heart Rate Variability (HRV) readings for all-day stress tracking. So what does the future hold? Will a Fitbit for our mind be popular? What can we do with the data? And will everyone appreciate being told they’re stressed when they’re feeling stressed? To answer some of our burning questions about using tech to track our minds, we chatted to Neema Moraveji, the director of Stanford University’s Calming Technology Lab and the co-founder of Spire, one of the first wearables built to track wellbeing. There are a number of devices on the market that have been created for wellbeing tracking. From breathing tracking with Prana, to heart rate tracking with WellBe through to ‘brain sensing’ wearables, like Muse, and Feel, which combines all kinds of data to read your mood. Spire uses a number of sensors and algorithms to identify how you’re breathing, whether characterised by parasympathetic activation, which is more calm, or sympathetic, which is more stressed. Big tech brands are using this kind of tech and building it into multi-purpose wearables, like the Apple Watch’s Breathe app and the stress tracking smarts in Garmin’s latest wearable, the Vivosmart 3. But as one of the first devices in the wellbeing tech space, we were keen to find out more about Spire and how it works. “Spire comes out of research we conducted specifically on using respiratory monitoring paired with digital devices to understand and manage stress,” Neema Moraveji told us. 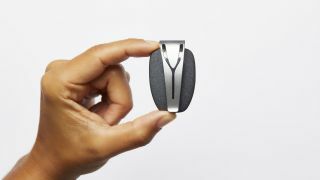 Essentially, Spire uses a number of sensors and algorithms to identify how you’re breathing. From there, it identifies whether your breathing is characterised by parasympathetic activation, which is more calm, or sympathetic, which is more stressed. In our eyes, the biggest hurdle to overcome when it comes to stress tracking is subjectivity. We were keen to find out how Spire and other wearables in the space are being tested in a range of settings - with a range of different people. The Spire can be hooked onto your waistband to keep tabs on your breathing throughout the day. “We’re collaborating and supporting research being conducted by different organisations using Spire,” Moraveji explains. Digging deeper into the idea of subjective experiences of stress, we wanted to understand whether stress tracking is broadly effective, or whether it can bring about great results for some and further exasperation for others. This is certainly the case with more fitness-focused wearables, so we imagine it’ll be even more apparent when it comes to the mind. Being told you didn’t hit your steps goal can be disappointing. Being told you spent the day stressed might leave you feeling even worse than you did before. So what’s the answer? Moraveji thinks it’s less about people and more about tech. Of course, this kind of tech really is still in its infancy, but we asked Moraveji what he thought the future would - and should - hold for stress tracking. Moraveji said: “Research has been done on sensing symptoms of stress including neurophysiological indicators such as respiration and heart rate variability, contextual cues like the way one is typing on a keyboard, the kinds of words one uses in email, and even the quality of one’s voice. Research has been done on sensing symptoms of stress [...] like the way one is typing on a keyboard, the kinds of words one uses in email, and even the quality of one’s voice. It’s interesting that his vision of the future is more of a joined-up approach. Imagine being able to tell you’re feeling stressed from the language you use in an email combined with breath data and being served up recommendations about what to do? If you’re prone to stress and anxiety, you need to be given steps and advice, or you’re not likely to make much progress. “Most research on actually addressing stress has been in the context of clinical practice, usually offline, and not using technology,” Moraveji told us. A huge part of the ambiguity here is likely that a lot of the words and descriptions of emotional states have no clear definition. The latest Apple Watch has an app called Breathe, which prompts you every few hours to lean back and take a few breaths. And when it comes to differences, let’s not look beyond the more simple things that set us apart; for example BMI, general body composition and different styles of breathing. Moraveji says the development of Spire is constantly informed by these subtle differences and earlier in the year the algorithm was changed to improve sensitivity for more tense breathing in certain individuals. Although wellbeing tracking for the masses could be hugely beneficial in helping us all to better understand stress and our triggers, it could also have the biggest benefits for those with more serious conditions, like severe anxiety and even PTSD. “We’ve created a clinical protocol that practitioners can use to help their patients manage symptoms of anxiety and stress using Spire,” Moraveji explains. Although wellbeing tech is still in its infancy, there’s a lot of potential for niche startups like Spire and bigger tech brands like Apple and Garmin to help people better measure stress levels and understand their mental state more than ever before. But, like with a lot of tech focused on our bodies and biometric feedback, the answer is personalisation. What might work for one person might not work for the next and a mixture of super sensitive algorithms, more advanced tech and feedback that proves useful, rather than more stressful, is needed for it to make a real, lasting difference.